If you’re pear shaped… A pear shaped body type tends to carry weight in the hips, rear, and legs–the lower half. A mid-rise, balanced style will flatter your shape because it will elongate your legs. Ideally, you should search for pair of moderate skinnies like these Mid-Rise Slim Boot Leg jeans by J Brand. This streamlined fit creates a sleek look that will flatter your curvy zone. Be sure to stay away from super high-waisted jeans at all costs–they will shorten your legs and create a disproportioning effect. 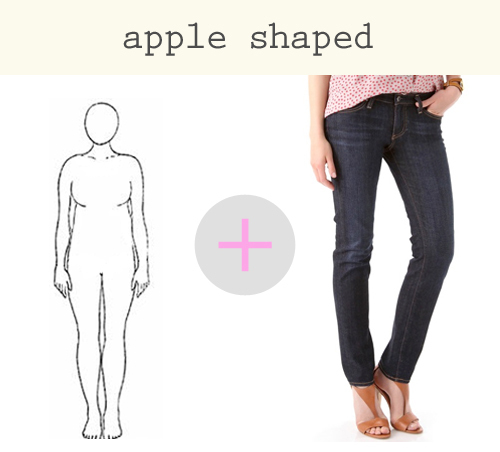 If you’re apple shaped… Apple-shaped ladies need their denim to provide a little more “give” in the waistline, because they tend to carry their weight around the middle. Choose a fit that has a straight leg so that it shows off your assets, but without making you look middle-heavy. The Stilt Cigarette Jeans by AG Adriano Goldschmied is a great choice for this figure. Steer clear of a super skinny, tight fit and avoid high-waisted trousers–which will draw negative attention to your middle area. If you’re curvy… Girls with curvy body types must be very careful to select a style that will create a slimming effect in all the right places. Show off your curves by picking a pair that hugs your assets and flatters not-so-favorite features. A lot of denim brands have fits that are marked “curvy,” which just means that the jeans are constructed specifically for curvier figures (plus they usually have some stretch to them, which is never a bad thing). Levi’s has a great line of jeans called the “Curve ID” collection that basically lets you choose your jeans depending on how curvy you are. I suggest trying the Low Rise Bold Curve Skinny Jeans. If you’re a curvy girl with a small waist you can rock the high-waisted trouser look because the cut will accentuate and flatter your tiny middle area. Lately, be sure to go for dark wash denim versus light to create a slimming effect. If you have a petite build… Petite girls can go for almost any cut, but it’s a good idea to try a pair of jeans that lengthens your legs. A long, super skinny cut will show off your tiny figure and curves, while a pair of high-waisted trousers will create the illusion of height and length (I suggest wearing a pair of heeled wedges to make your legs look even longer). I love the Avedon Slick Skinny jeans by Citizens of Humanity for a petite build because they flatter your shape and they appear give your legs a couple extra inches. Low-rise jeans will also showcase your petite build. Just be sure to avoid anything that is too baggy–you will look like you’re drowning in denim! SOS! 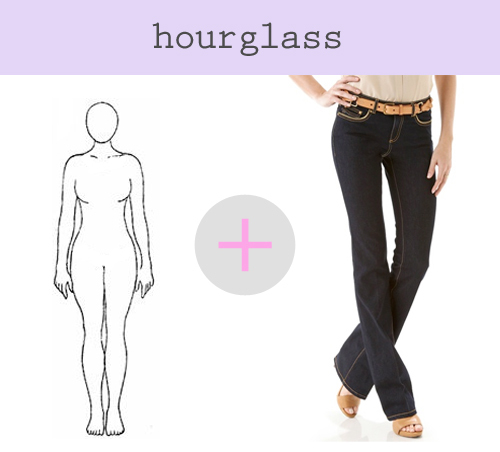 If you have an hourglass figure… If you have the curvy but balanced body type we call “hourglass.” This figure can wear almost any cut. but it’s important to show off your curves the right way, and skinnies will highlight your curves. A pair of wide-legged trouser jeans will work wonders for enhancing your waist, so try a pair like my LC Lauren Conrad Slim Bootcut Jeans. Also, make sure that you pick a pair that isn’t too low rise, or you might be exposing a little too much of your curves every time you sit down…if you know what I mean. If you’re dying to try a skinny leg style, choose one that has a contoured waist and is made from a stretchy material so that it will give a little in the hips and rear. If you’re tall… If you’re lanky and lean, go ahead and show off those gorgeous gams. A low-rise pair will help give your shape proportion, and a high-rise style will make your legs look like they go on for days (which is never, ever a bad thing). You can rock a trouser style, a balanced boot cut, flared jeans (like this mid-rise cigarette style by J Brand), or an ultra skinny fit–just make sure that whatever style you choose emphasizes your best feature. If you have an athletic shape… For girls who have toned, athletic bodies, your best bet is to create curves while evening out your shape at the same time. 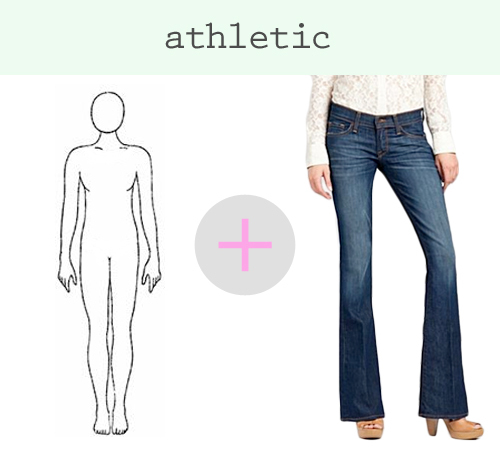 I would suggest bootcut or flared jeans that are fitted around the thighs and bum, but a little more relaxed around the calves and ankles. A pair like Lucky Brand’s Charlie Flare jeans will balance a boyish silhouette while offering the illusion of a curvier figure. Trends in fashion come and go, and some denim styles are fun to experiment with (70s bell bottoms anyone?). But a pair of jeans that truly flatters your figure and hugs your body perfectly will always stay in style. At the end of the day, try on a lot of different styles and see what you feel the most comfortable in. Personally, I adore dark denim skinny jeans. It took me a little while to figure out that this color and cut is my go-to. Now that I know what works for me, I can confidently shop for denim without hesitation. Tell me about your favorite pair of jeans in the comments below. Also, if you have a fashion question, let me know about that too! P.S. If you liked this denim guide, be sure to check out Anna’s post on how to find the perfect skirt for your body type.